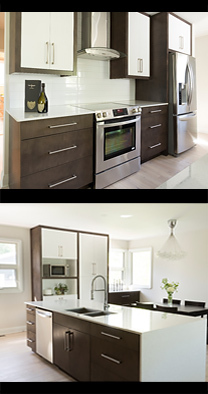 If you’re looking for a creative interior designer in Winnipeg to help with your home renovation or new home construction, Harwood Design Builders Inc. has a talented team to make your dream home a reality. This interior designer website is published by Winnipeg based, Harwood Design Builders Inc. to showcase some of our interior designers work, as well as to highlight the superior building and finishing by our skilled construction teams who take pride in every detail. Our senior in-house interior designer, Geneviève Joyal is simply brilliant with colours, textures and space. She uses her unique design talent to strike a balance between high style and livability in a space you can truly call home. Her professional training ensures a functional and quality interior environment. Whether you’re looking for sophisticated and modern or classic luxury, this Winnipeg Interior designer will work with you through the design build process and have you laughing, entertaining and relaxing in a space you’ll love. The process our Winnipeg interior designers follow helps ensure our projects are completed to the highest quality standards. The first step is discovery. We meet with you to find out what’s important to you. What your needs and aspirations for the space are as well as your budget and time line. We will then identify and prioritize the key requirements. What style are you looking for? Do you prefer modern, traditional, classic or perhaps art nouveau? Who will be living in and using the space? Are you single, married or retired? Do you have small children where safety is a concern or do you have older kids who like to hang out with their friends? Do you love cooking and entertain regularly or are you after a quiet place for peace and serenity? Is there someone with health or mobility issues? Do you want a space that’s environmentally friendly? Our goal is to understand what you do in your space(s) because we’ve found designing rooms can be restrictive because you may have a video entertainment space in your rec room, an island bar for gathering and a workstation off to the side for paying your bills. We design spaces that will accommodate your activities because this approach will make your new space livable and enjoyable for you. Once we’ve learned more about you and your vision we start to work on generating 3D graphics considering such things as light, noise, function, etc. We look at the relationship of each item to every other item. For example, if you enjoy cooking and like to refer to your computer of tablet for recipes in your kitchen we might look at a small workstation or nook for easy access. We will ensure there is an electrical socket close by, that sun glare from overhead windows are considered and that traffic patterns are well-thought-out so you’re not in a high traffic location. At this stage we also look at colours, textures and finishes to create the mood you’re looking for. Do you want white and bright or warm and cozy? Carpets, ceramic tile or hardwoods? The choices and details are considerable so this step takes time as everything is scrutinized to ensure the most efficient and effective results. Before moving on to purchasing and implementation of the design we meet with you to talk about all the fine details. This is a critical step to ensure our Winnipeg interior designers deliver what you’re looking for. Now the fun begins. The materials list is finalized, ordering takes place, construction begins and your vision starts to take on new life. Our construction team has expertise second to none in the industry. From deconstruction to finishing, each action is thought out and expertly executed until the job is complete. Our reputation as an Award Winning design build company speaks for itself, but we encourage you to see what our customers are saying about us on our main website, www.harwoodbuilders.com. You are also invited to read Geneviève’s articles in the Winnipeg edition of Home Décor and Renovations magazine, or the many other articles Harwood has been featured in, including; Covet Magazine, Ciao, Style Manitoba and Home Décor and Renovations. If you’re looking for a talented interior designer in Winnipeg for your new home construction or renovation project consider Harwood Design Builders. The pleasure would be all ours.